See, for example, William Gudenrath, "Techniques of Glassmaking and Decoration," in 5000 Years of Glass, ed. Hugh Tait, London: British Museum Press, 1991, pp. 213-241. To search the library’s book and periodical holdings, go to rakow.cmog.org. 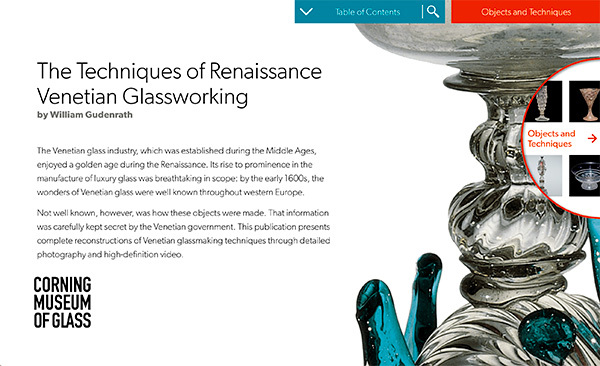 For books and periodical articles on glass made in the Venetian manner, go to cmog.org/askalibrarian. David Whitehouse, “William Gudenrath: The Art of Experiment,” GLASS Magazine (New York Experimental Glass Workshop), no. 41, Fall 1990, pp. 40–43. For a concise yet thorough general history of Renaissance Venetian glass, see Hugh Tait, The Golden Age of Venetian Glass, London: British Museum Publications Ltd., 1979, and, more recently, Erwin Baumgartner, Reflets de Venise: Gläser des 16. und 17. Jahrhunderts in schweizer Sammlungen = Reflets de Venise: Verres des XVIe et XVIIe siècles de collections suisses, Bern: P. Lang, and Romont, Switzerland: Vitrocentre Romont, 2015. Tait [note 4], p. 7. R[obert] J[esse] Charleston, English Glass and the Glass Used in England, circa 400–1940, London: George Allen and Unwin, 1984, pp. 53–56, 58–60, and 66–69. Richard Lassels, The Voyage of Italy, Paris: printed by Vincent du Moutier, 1670, pp. 423–424 (available on Google Books). Marie-Laure de Rochebrune, “Venetian and Façon de Venise Glass in France in the 16th and 17th Centuries,” in Jutta-Annette Page, with contributions by Ignasi Doménech and others, Beyond Venice: Glass in Venetian Style, 1500–1750, Corning: The Corning Museum of Glass, 2004, pp. 142–191, esp. p. 146. Dedo von Kerssenbrock-Krosigk, personal communication, June 14, 2018. For the Swiss Goblet, see Baumgartner [note 4], pp. 242–272. For the Winged Glass, see Majolica and Glass: From Italy to Antwerp and Beyond. The Transfer of Technology in the 16th–Early 17th Century, ed. Johan Veeckman and others, Antwerp, Belgium: Stad Antwerpen, 2002, pp. 95–124 and 161–172. Gudmund Boesen, Venetianske glas på Rosenborg = I vetri veneziani del castello di Rosenborg = Venetian Glass at Rosenborg Castle, Copenhagen: I kommission hos G.E.C. Gads Forlag, 1960, pp. 63–79. Jutta-Annette Page, “Introduction,” in Beyond Venice [note 8], pp. 18–19. For an overview of the Venetian glass industry and its competitors during the Renaissance, see Ada Buch Polak, Glass: Its Tradition and Its Makers, New York: Putnam, 1975, pp. 53–80. Page [note 12], pp. 5–6. Jutta-Annette Page, “Venetian Glass in Austria: The Court Glasshouse in Innsbruck, 1570–1591,” in Beyond Venice [note 8], pp. 42–55. See renvenetian.cmog.org: “Enameled Goblet,” “Enameled Bowl,” and “Enameled Tazza.” See also William Gudenrath, “Enameled Glass Vessels, 1425 B.C.E.–1800: The Decorating Process,” Journal of Glass Studies, v. 48, 2006, pp. 23–70. Five Thousand Years of Glass [note 1], p. 174. The History of Glass, ed. Dan Klein and Ward Lloyd, London: Orbis Publishing, 1984, pp. 82–83. Based on Polak [note 13], pp. 74-75; and Reino Liefkes, "Façon de Venise Glass in the Netherlands," in Beyond Venice [note 8], pp. 226-249. Jan M. Baart, “The Façon de Venise Glass of Amsterdam,” in Majolica and Glass [note 10], pp. 161–171. “Serpent-Stem Goblet,” in Robert J. Charleston, Masterpieces of Glass: A World History from The Corning Museum of Glass, New York: Harry N. Abrams, 1980, pp. 126–127. For a typical object built “on the blowpipe” in this publication, see Tall Flute; for a typical example of “building an object from pre-made parts, attached using glue bits,” see Dragon-Stem Goblet. Polak [note 13], pp. 72–74; Rochebrune [note 8], pp. 142–163. The History of Glass [note 31], pp. 87–89. Charleston [note 6], pp. 53–56, 58–60, and 66–69. Five Thousand Years of Glass [note 1], p. 169, caption for figure 215. “Royal Covered Goblet” in Charleston [note 37], pp. 128–129.